Register Log In Moparts Forums Corners Are Best - Handling Tech LOWER BALL JOINT -- HIGH FRICTION? I'm replacing my older front spindles with '73-up so to install the 11.75" Cordoba rotors (still to buy); engine is out and won't be installed until a few months from now. I've purchased new Moog Lower Ball Joints; Upper Ball Joints still good, not loose, etc... reusing them. I've also welded the K-frame and added lower control arm reinforcement plates (all Firm Feel, etc); engine bay also re-done like new! When I torque the UPPER BJ nut (100 ftlbs) and the LOWER BJ nut (80 ftlbs.. per my Challenger spec manual) then try to turn the spindles by hand L-R, there is a lot of effort required... doesn't seem correct... very tough to turn L-R by hand. I had used anti-seize lube on the UBJ and LBJ studs and threads, so, disassembly was easy.... re-did the install, same results. I've noticed the UPPER BJ stud turns when I grab and turn the assembly, but the LOWER BJ stud doesn't turn. Could the anti-seize be causing the LOWER BJ stud NOT to turn, even though its torqued to 80 ftlbs? I had also re-greased the UBJ and LBJ with red synthetic grease, gushed out to assure enough was inside. The UPPER BJ stud (attached by itself) allows free motion of the spindle (and not loose or wobbly), but when I attached and torque the LOWER BJ stud, that's when the problem seem to develop -- very difficult to move the spindles L-R.
Could these new LOWER BJs be bad? Why are they so tight and won't move (twist) like the UPPER BJ stud? I'm tempted to buy another pair of LOWER BJs (perhaps Moog, again); maybe a different brand. 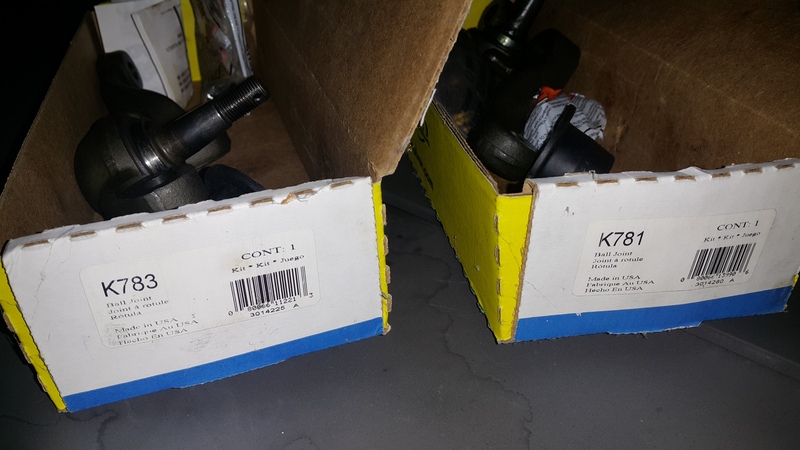 I know for a fact that the OEM front suspension parts (BJs, tie-rods/ends, etc) were all from TRW -- they supplied the dominance of the OEM big-three suspension parts back then), but they are hard to find in the aftermarket.... Moog is pretty dominant now. Any helpful advice or replies will be appreciated. I have a set of brand new unused Moog LBJ's that I keep as spares. I'll report back if they spin like my Howe UBJ's. I remember that the Moog LBJ's and UBJ's were tight when brand new, unlike the Howe which is buttery smooth. I forgot if the LBJ's spin around though? You realize that using antisieze on the threads results in substantially more effective torque than specified. Do not substitute, or use, lubricants unless specifically called for. Unless you are capable of recalculating the required torque. You've probably overstretched the stud. T/Anks for both of your replies. I did a bit of research, as a rule of thumb when using antisieze you should drop the torque value 40% compared to dry. I just got some Moog LBJ's for my Demon and they have a lot of resistance, they don't move freely. Do they normally come with blue grease in them from Moog? thank you for posting that chart link. i had one at one time, but it didn't include the metric information. Yes... Thanks for the chart. I recall seeing a blue grease inside the Moog LBJ. I'm thinking the operation of the BJ will be affected once the suspension is loaded. I phoned the Moog tech line today.... spoke with Jerry. He commented that the usage of the anti-seize on the studs and threading should not have made any difference to the functioning of the ball joint. He said the studs of the ball joints are tough and rather stiff, but they will loosen and become more free as the car is used. The studs should twist L-R as the spindle is also turned L-R. I'm going to disassemble the BJs and clean-up the anti-seize, anyway, and re-torque carefully. Also, I'll see if the LBJ can be moved by disconnecting the UBJ first, then leveraging the spindle so to see if the LBJ stud will actually move. If I'm not pleased, I may just go ahead and purchase/replace again the LBJs. One other thing, when I first torqued the passenger side together, I was torquing with the tall rubber snubber (under the the UCA), which I have extended the height, against the UCA, in other words, the rubber snubber was being compressed as I tightened the spindle upper and lower nuts... possibly making the effort tighter.... and that's the spindle assembly with much more friction making it difficult to turn L-R. However, when I re-did it without the snubber, it made no difference. 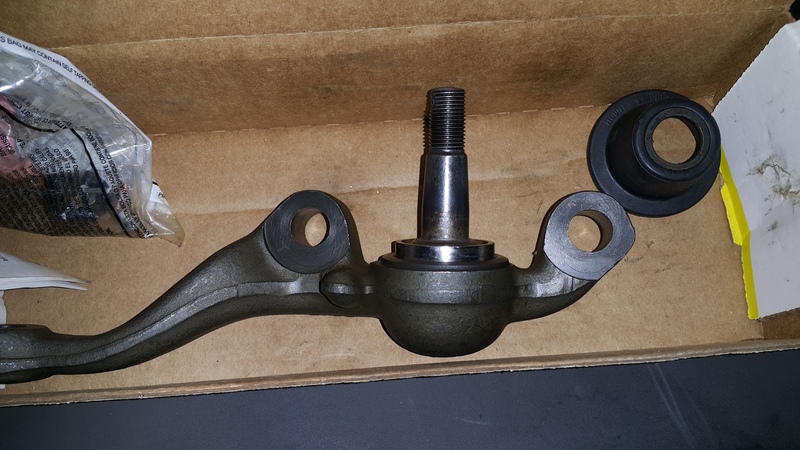 Then, when I did the driver's side, I didn't install the extended rubber snubber, so, it was easier to torque the nuts.... less friction overall turning the spindle L-R. So, maybe I may just need to replace the passenger side LCA... ;possibly it was extensively over-tightened within its guts. Learning lessons! I'll let everyone know of the final outcome. Last edited by Mopar Mitch; 02/07/18 12:30 AM. Keep an eye out for different stud lengths on the ball joints, even with the oe replacement stuff. I've been seeing a trend for awhile now where the stud length is not the same as what was removed and you now have to stack washers under the nuts to get the cotter pin hole to line up with the castle nut slot. Both the tapered portion of the stud and the straight portion have been changed. When I was at SEMA, I talked to the rep from ProForged about this and he verified that the companies, his included, have consolidated a lot of stud differences and use one stud to fit many more applications as opposed to being the correct length. Changes in the stud length can change your geometries plus can cause binding issues if the joint hits other components. Here is my brand new Moog LBJ's. Super tight from the factory. Not able to turn them L-R, front to back easily at all. I would just run those LBJ's Mitch! Should not be a problem. The middle pic also shows the type of dust boot to run with ball joints as they have an inner metal ring that helps hold the grease in place. Also while the engine is out Mitch, slap in a Gen3 with a six-speed to replace it! RylisPro -- T/Aanks for the effort you've offered. Those rubber boots were a bit difficult to install so to grasp in-place. those lower boots, i used my upper ball joint socket and a hammer to tap the boots onto the lip of the LBJ body. 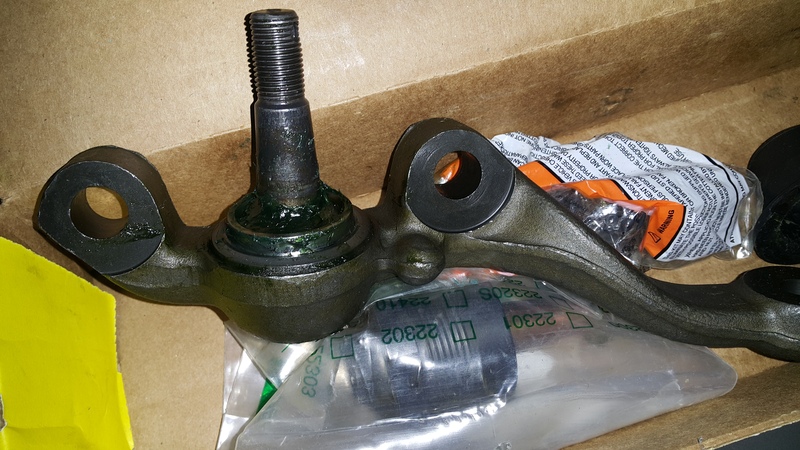 I opened a box O Ball joints, yep very stiff just as a remember. But I have not hat the stud turn in the control arm. I had to log in to ask about this because it sounded so wrong to me... why would you ever want to see a ball joint stud twist after installation? Doesn't that mean the stud isn't actually seated in the spindle taper? I was pretty dead sure stud is supposed to stay in place until you take the nut off and knock it loose from the spindle taper, at least that's how I've been operating for years. I re-did the problem side that was super stiff (bought another new LBJ). and this time I didn't tighten it against the extended rubber snubber... now A-OK... same as the other side.. both same with minor friction. It looks to me as though I over-tightened that one stud.. appears possibly bent. So, a learning lesson to me. T/Anks for the replies to all! Forward motion on the re-assembly of the car! Engine has been brought to a shop for prepping.